One of my favourite occupations in Spain or France – and now Switzerland/Germany – is sitting on the floor of bookshops, supermarkets and any other likely looking shop, poring over children’s books. I could – and often do – spend hours searching for gems that I can use in the classroom. I consequently have a large collection of books but many are either out of print or “don’t exist” in searches as I bought them in supermarkets. De quelle couleur est ta culotte (shared earlier this week) is one such out of print book – you can get it but it costs a week’s wages! Two of today’s books belong to another category – they ‘exist’ (obviously as I have copies!) but can’t be found for love nor money! However, I’m still going to share them as the ideas can be used with other books of a similar vein, or with homemade presentations instead of a commercial book. I found ¿De qué color es Elmo? in a shop in Benalmadena about eight years ago and it instantly became a favourite, particularly with Nursery/Reception. The book poses the question ¿De qué color es Elmo? and each double page spread offers a suggestion as to his colour on the left hand page with the response on the right hand page indicating that another character is that colour as well as an object in the picture, before finally suggesting the correct colour on the final page! It’s repetitive – it’s easy to respond to the question with a loud ¡NO! however old you may be! 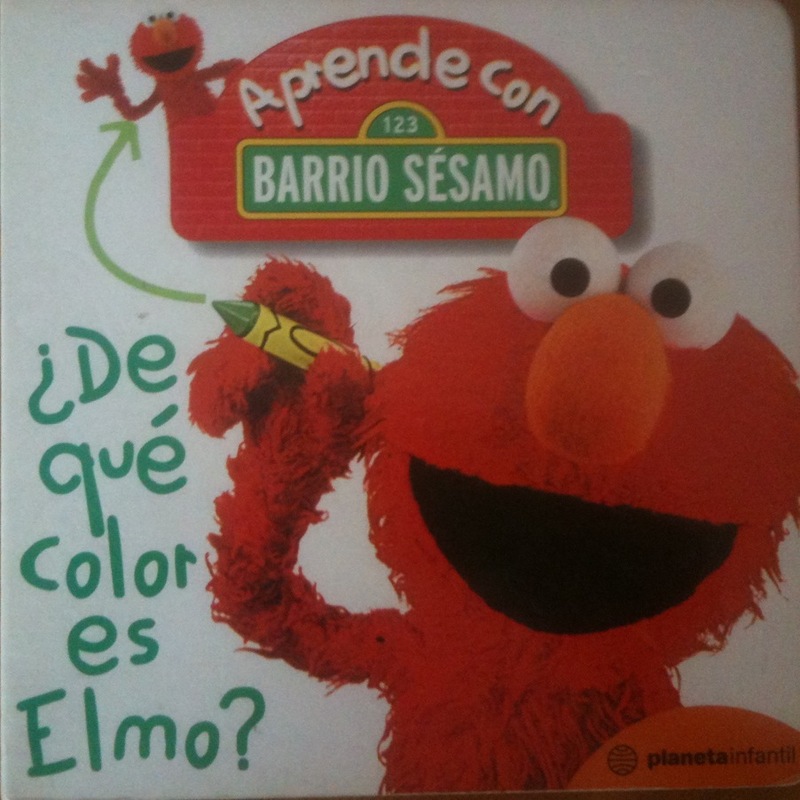 Or join in with the suggested colour when I pause ¿Es Elmo….? by looking at the colour of the writing! Sesame Street is always a winner as the characters are so friendly. Many younger learners don’t know the English names for all characters but they do know Elmo! And those that recognise Big Bird are quite happy to accept that he’s called Paco Pico, or that Grover is called Coco! The pictures are clear and interesting. 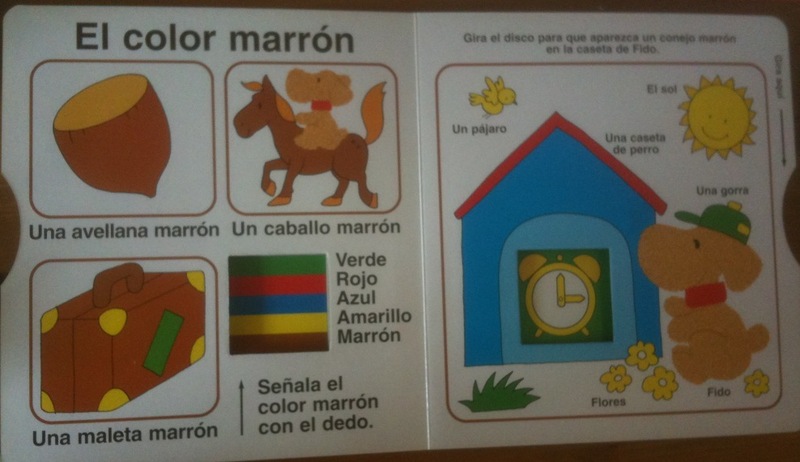 Once we’re familiar with the book we look for other objects in the pictures that are the colour suggested. For example, the house – la casa – is suggested on this page. 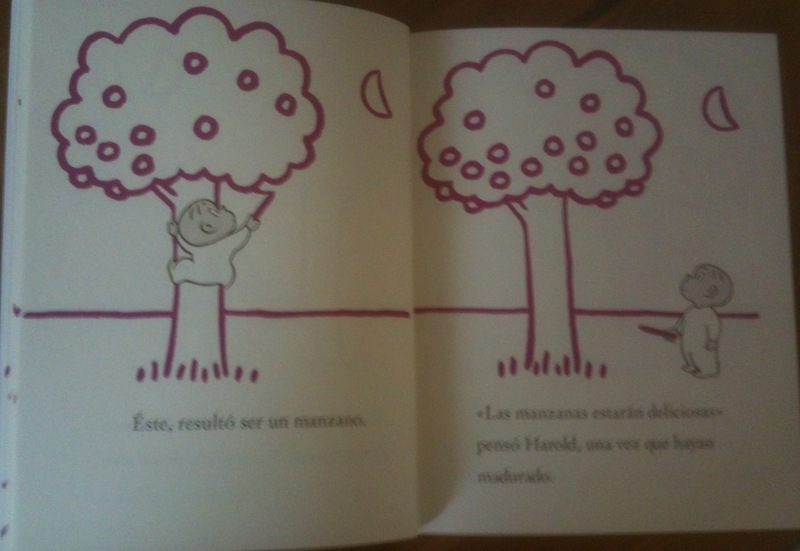 Then we turn the page and look in other pictures. And then we start looking around the room for more ideas. Sometimes we play “Traeme algo ….” – this worked really well when the age of my pupils spanned 1 – 3 years as the little ones were happy looking and pointing whilst the older ones needed a bit more challenge! As a follow on activity we might build up a collage of images in the different colours, like mini mood boards with a character at the centre of each. Older learners might label them. 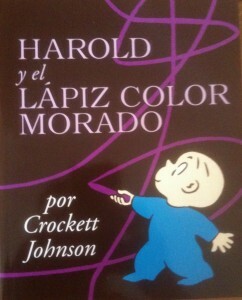 As I said, I bought this book years ago along with another called ¿Qué oye Epi?, a lovely story about what Epi (Ernie!) can hear as he sits by his window. Unfortunately that book went missing and I can’t replace it. Fortunately I had ‘blown it up’ into a display so can hopefully find where that is (I’m a bit of a hoarder!) and use it again. 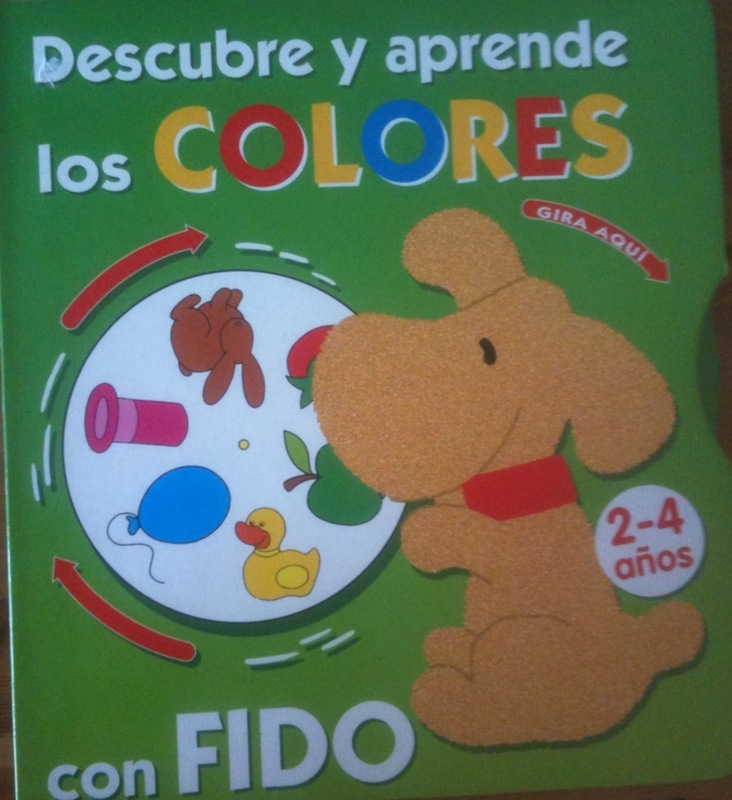 Another book I have that is good for very little ones is Descubre y aprende los colores con Fido. 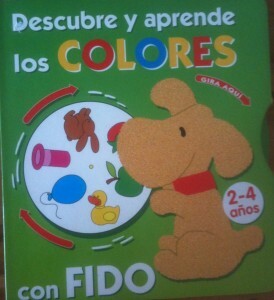 I found this in a discount bookshop in Spain along with Descubre y aprende los números con Fido for 2,95€. I’m sure that there are many equivalent books out there! 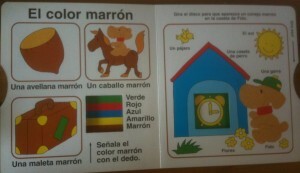 Each double page focuses on a colour – verde, azul, rojo, amarillo and marrón (not an obvious choice for me but it works!) – and has a number of things to do. other labelled items that ‘go with’ the object on the wheel – in this case, things in the garden around Fido’s kennel. This book works best with small groups of children or as a book for independent learning although you could use a visualiser to share it with a whole class, inviting individuals to point/turn the wheel whilst everyone else watches on the screen. My final book (for now as I haven’t found them all yet!) on the subject of colour is Harold y el lápiz morado. Harold is a little boy (in a onesie!) who decides one night, after much thought, to go for a walk in the moonlight. But there’s no moon… so he draws one with his purple crayon. 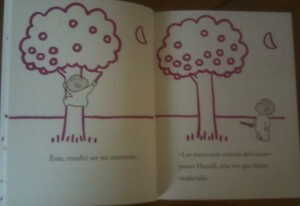 And then he draws the path and the adventure begins as the purple crayon brings Harold’s thoughts to life. 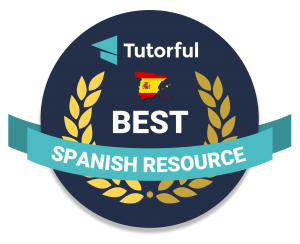 Pingback: Favourite books for PLL – Counting ovejas / Diez orugas cruzan el cielo / Descubre y aprende los números con Fido « ¡Vámonos!